Misc. Readily distinguished from other oaks by its hairy buds and its leaves, which are lobed, bristle-tipped, and with hairs on the underside, the large hairs being stellate (branched). 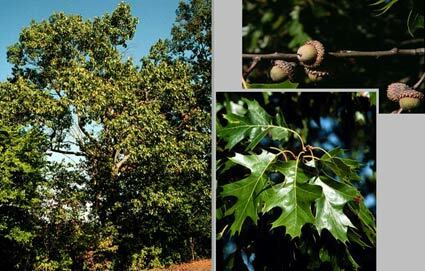 The Southern NJ’s most common oak species from the red and black oak group (those oaks with bristle-tipped leaves). Oaks support some of the forest’s greatest diversity. They begin to produce acorns at about 20 years and produces the greatest amount of acorns between 40-70 years. Many birds such as wild turkey, wood duck, quail, woodpeckers, thrashers, and chickadees forage on acorns; blue jays disperse them widely by planting acorns in soft soils. Mammals such as squirrels, deer, mice and other rodents consume acorns. Oaks are plagued by a number of diseases.